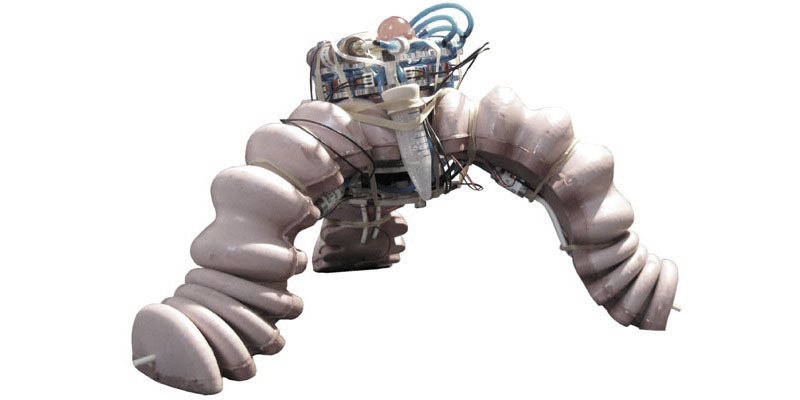 Abstract – Locomoting soft robots typically walk or crawl slowly relative to their rigid counterparts. In order to execute agile behaviors such as jumping, rapid actuation modes are required. Here we present an untethered soft-bodied robot that uses a combination of pneumatic and explosive actuators to execute directional jumping maneuvers. This robot can autonomously jump up to 0.6 meters laterally with an apex of up to 0.6 meters (7.5 times it’s body height) and can achieve targeted jumping onto an object. The robot is able to execute these directed jumps while carrying the required fuel, pneumatics, control electronics, and battery. We also present a thermodynamic model for the combustion of butane used to power jumping, and calculate the theoretical maximum work output for the design. From experimental results, we find the mechanical efficiency of this prototype to be 0.8%. M.T. Tolley, R. Shepherd, M. Karpelson, N. Bartlett, K.C. 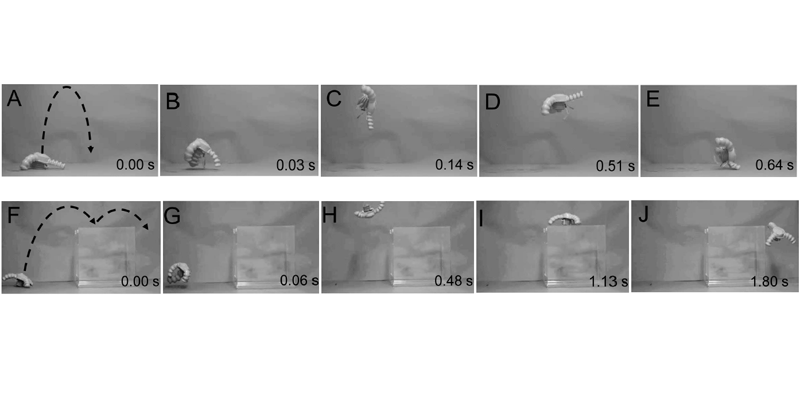 Galloway, M. Wehner, R. Nunes, G. Whitesides, R. Wood, “An Untethered Jumping Soft Robot,” IEEE International Conference on Intelligent Robots and Systems (IROS), 2014.